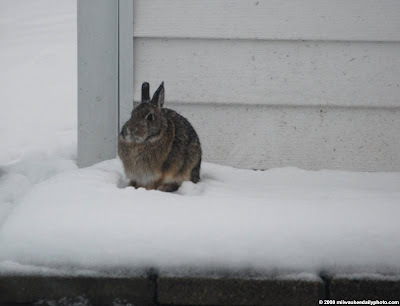 This rabbit has been hanging around our house, waiting for the birds to find their feeder in our backyard. Once they do, he'll be there to pick up whatever seeds the birds drop or throw onto the snow. It's been the better part of two weeks now, and they still have not found the feeder. No wonder he looks so grumpy. AW, I always put out old carrots and apples for our rabbit. We don't' feed the birds, because of a cat and our dog. One night, my rabbit came by. I had been saving an apple for him. I went it, got it and tossed it in the yard. To my amazement, he went right over to it and started eating. What a moody face. Made me lol.